Carl E. Clark II, President, and C.E.O. of Devereux Advanced Behavioral Health visited Devereux Georgia and hosted a Town Hall Meeting where he met with and answered questions from staff. Mr. Clark gave an exciting presentation that focused on the vision for the future of our organization and the impact that it will have on Devereux Georgia. The presentation concluded with a Q&A where staff had a moment to share their thoughts and suggestions about the direction of Devereux. All and all, the Town Hall was an extremely successful exchange of thoughts and ideas. We are thrilled to have new C.E.O. who is dedicated to ensuring Servant Leadership is a part of our organizational culture. 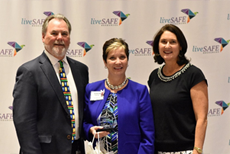 Gwen Skinner, VP of Operations, Devereux Advanced Behavioral Health and Executive Director, Devereux Georgia, was named one of 15 of LiveSAFE Resources’ “Women of Achievement” for her work and dedication in protecting victims from domestic and sexual violence. Gwen has made it her life’s work to support those who are most vulnerable in our society. Her dedication is evident through her 30 years of behavioral health experience and ten years with Devereux. "The awards ceremony brought together some of the most generous and caring women who unselfishly give of themselves to their communities, and it was a great privilege to be recognized alongside them,” Skinner stated. Congratulations Gwen! At Devereux Georgia, We Are Servant Leaders! 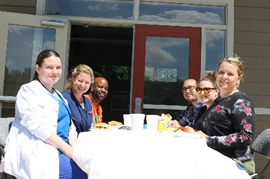 This month we celebrated Servant Leadership with a Staff Appreciation BBQ and Servant Leadership Expo. The purpose of the BBQ and Expo was to fellowship and show each other how Servant Leadership is woven into the fabric of each department. 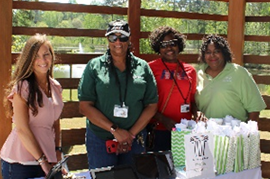 Employees got a chance to see how each department represented a different pillar of Servant Leadership. By embedding Servant Leadership into our daily work, we are creating an environment where employees feel empowered to voice ideas that will benefit individuals, staff and the overall organization. At Devereux Georgia, we strive to ‘raise the bar’ and work to exemplify Servant Leadership! Devereux Georgia would like to thank Ms. Mary Prior for selflessly giving her time and positive spirit to serve as a beacon of light in our organization. In the last year, Ms. Prior has served 673 hours! Her dedication and service to People Operations and Devereux Georgia is much appreciated. Volunteers like Ms. Prior are part of the heartbeat of our organization. Devereux Georgia is happy to announce we have received a grant from Allstate Hands in the Community. Allstate Foundation Hands in the Community promotes local volunteerism by granting awards to Allstate representatives who serve in the community. At Devereux, we would like to extend a huge thank you to Joe Glancy, Allstate representative, Advisory Board Member and Ex-Officio for his continued service to our organization. Through Joe’s support, Devereux Georgia was able to receive this grant. Are you an Amazon Prime member? Do you order everything from coffee to new tech gadgets to be delivered right to your door? Well, then what's the harm in adding another item to your cart to support Devereux kids? We could always use socks, underwear, body wash, etc.! Check out our Wish List! Are you looking for a unique and impactful way to help, but don’t quite know how? You can become a fundraiser and build awareness and support for Devereux Georgia! We have launched an innovative crowdfunding campaign that allows you to create your own Devereux Georgia online fundraising page. The fundraising page allows you to create a targeted fundraising campaign where you set goals and giving levels to share with your network. For more information on how you can become a fundraiser. Our Annual Hope Event: Painting a Picture of Hope will be held on September 19, 2019 at the Marrietta Country Club in Kennesaw. Each year, Devereux Georgia host a fundraiser event that celebrates the art created by the youth we serve. If you are interested in becoming a sponsor, please contact Liz Bunder at elizabeth.bunder@devereux.org. Want to hear about all of the great things we’re doing at Devereux Georgia? Follow us on Social Media!